The cushion cut is an antique style of cut that looks like a cross between an Old Mine Cut and a modern oval cut. Cushion cut diamonds are not the traditional diamond cut for engagement rings, but they're a lovely romantic cut that's a perfect choice for your engagement ring. Before 2006-2007, it was difficult to find Cushion Cut Diamonds for sale outside of estate sales and auctions. However, cushion cuts are enjoying a small surge in popularity and are again being offered by select diamond sellers, such as Blue Nile or James Allen. This cut is not as fiery or brilliant as many of the newer cuts, but it has a marvelously romantic and classic look and definitely stands out from the crowd of round brilliants. Standards for cushion cut diamonds vary widely and more than with most contemporary cuts, much is left to personal taste. So you will easily find cushion cuts that are nearly square, long rectangles, and with varying size tables and depth percentages. Because of the large open facets of the cushion cut, opt for the highest clarity and color your budget affords. If you're looking for a stone that most closely matches the original cushion cut (like the first one in the above image, a rectangular shape), opt for a length/width ratio of 1.25 - 1.30. While not the traditional selection, cushion cut diamonds are a romantic stand out from the common round brilliant generally selected for engagement rings (either as a solitaire or with accent stones). Cushion cut diamonds do require a minimum four-pronged settings (as pictured) and larger stones will require additional prongs to keep the stone secure in its setting. To give you some ideas of what's available for a cushion cut diamond ring, we've preselected a range of certified cushion cut diamonds for you to examine (all from James Allen and Blue Nile, two premiere diamond stores). Except for the "Bargain Basement" selections, these diamonds are within our minimum requirements as listed above and are suitable for solitaire settings or settings with accent stones. 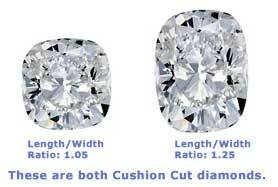 PLEASE NOTE: It is often difficult to find cushion cut diamonds in the smaller carat sizes. If you're looking for a diamond under one carat, you'll have a much greater range of choices if you select a Radiant Cut Diamond.